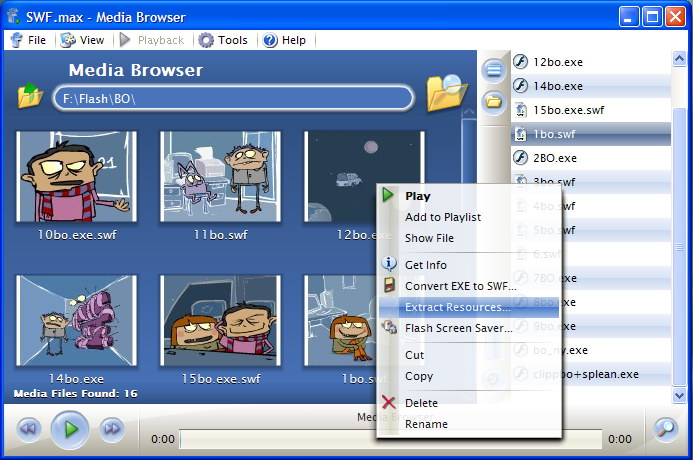 Full-featured Flash Player. It supports extraction of movies from projectors (exe's), displays current time and plays movies in original size and using proper backcolor. Also it has special thumbnail supported media browser. SWF.max features are: + Full Screen Mode (including skin support) + Enhanced Skin Engine + Thumbnail Enabled Media Browser + Drag'n'Drop Support + Saving Movies As... + Movie Volume Control + Detection of Movie Backcolor + Detection of Frame Rate and Playing Time + 'Get Info' dialog with thumbnail Watch Flash movies with .maximum comfort.